Check out what some of our previous clients have to say. Tim went above and beyond to cater to our needs even outside of being our DJ. He made sure my husband and I always had a smile on our face while keeping everyone on the dance floor. He made sure every request by our guests and ourselves were played, but that the priority was always on our choices first. This was at our request and he followed through. Would recommend him to everyone!! TM Sound provided the music for our wedding reception and I couldn't be happier with our choice! Tim was professional and accommodating to all of our requests. He was very thorough in explaining how to personalize our music to fit our wedding. He played the songs that we chose and also did a great job of adding variety the playlist to keep people dancing! I would definitely recommend TM Sound! You helped make our HalloWedding amazing! Very sincere and interactive! First priority are their customers satisfaction! Would recommend TM Sound to everyone! So professional but laid back did not treat it as it was just 4 the money definitely made the night ty again. 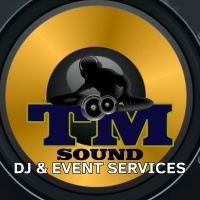 TM Sound donated its services during a cancer benefit that I had put together. Words cannot express the graditude I have for this company and the gentleman behind it. It was absolutely amazing. The energy of the benefit was upbeat due to the music being played. Requests were taken and TM sound also assisted with number calling for the basket raffle. It was a true honor to have them play at this event. I would reccommend them a million times over for any event. Nothing is too big or too small for TM sound to handle. Superior! The best! Works hard. Very nice! Audience loved him.